I remember the first time I tasted a rotlo. I was about 5. My family had just moved back to India and I was just getting used to life without breakfast cereals. 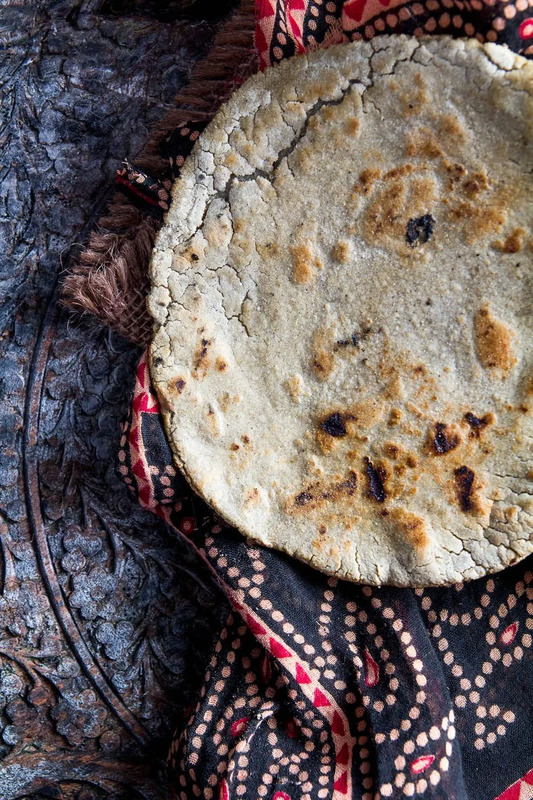 One night my mom made these dense dark flat breads for the family. They looked different from the traditional wheat rotli I was used to eating. In fact, my mom assumed my brother and I wouldn’t eat them and made something else for us. I saw the enthusiam with which my dad and grandpa ate them though and was inspired to try them. I was given half a freshly baked rotlo, a dollop of ghee and some jaggery on a little plate. (Jaggery is dried sugar cane juice that still contains molasses). I broke off a little piece, dipped it in ghee and jaggery. I was slightly unsure about how this fat, dark bread would taste. But the second I tasted it I was in love. Rotlo, known as a bajra roti in Hindi, has an earthy flavor that is so delicious with the caramel flavors of jaggery. And adding ghee to anything never hurts! In a medium bowl, mix together the bajri flour and salt. Add the water and mix with your hands or a wooden spoon until it forms a smooth dough that looks a little like clay. Line your rolling surface with a sheet of parchment or plastic. Skip this step if you are confident in your rolling abilities. Having the parchment helps to avoid sticking and makes it easy to transfer the rolled out flat bread to the pan. Take one disc of dough, make sure to cover the rest so they don’t dry out, and press both sides into the extra bajri flour. Place the disc onto the parchment or plastic sheet. Sprinkle some more dry bajri flour on top of the disc and roll it out into about a 6 inch disc. Add more dry flour as needed. Heat a 12 inch cast iron skillet or a non-stick skillet (if using non-stick, heat with a tablespoon of oil and wipe the oil away when ready to cook the flat bread) over a medium heat. Put a single rotlo on the pan. Brush the top with some water. After about two minutes, when the rotlo has a few bubbles and starts to brown underneath, flip the rotlo over. 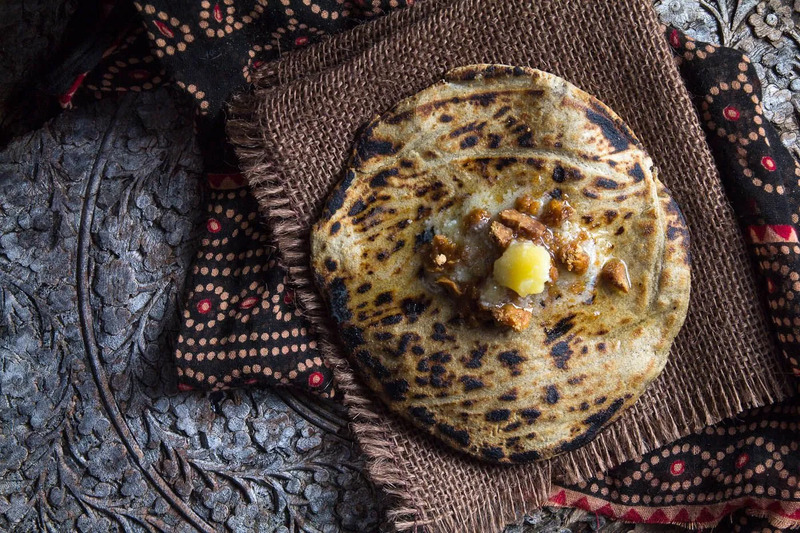 When the rotlo is evenly cooked on both sides, remove it from the pan and toast it directly over the flame for about 20 to 30 seconds. Make sure to move the rotlo around to avoid burning. Transfer to a platter and brush with 2 teaspoons of ghee or coconut oil. 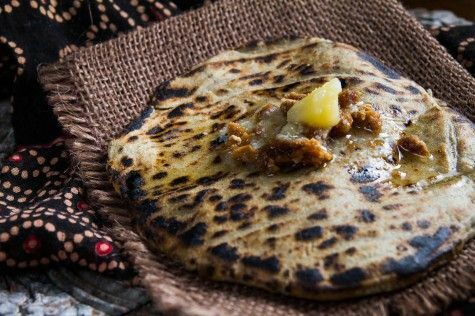 Along with jaggery, rotlo also goes great with eggplant. 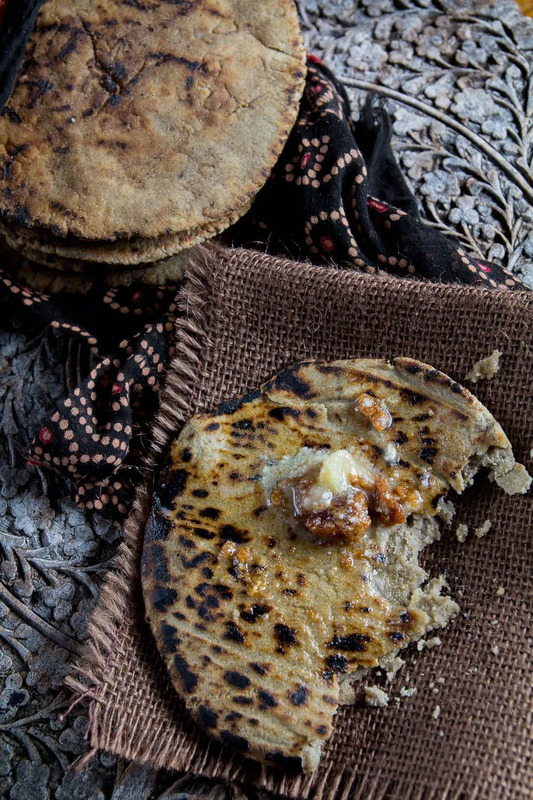 If you have a hard time finding jaggery, palm sugar or piloncillo make a great substitute. 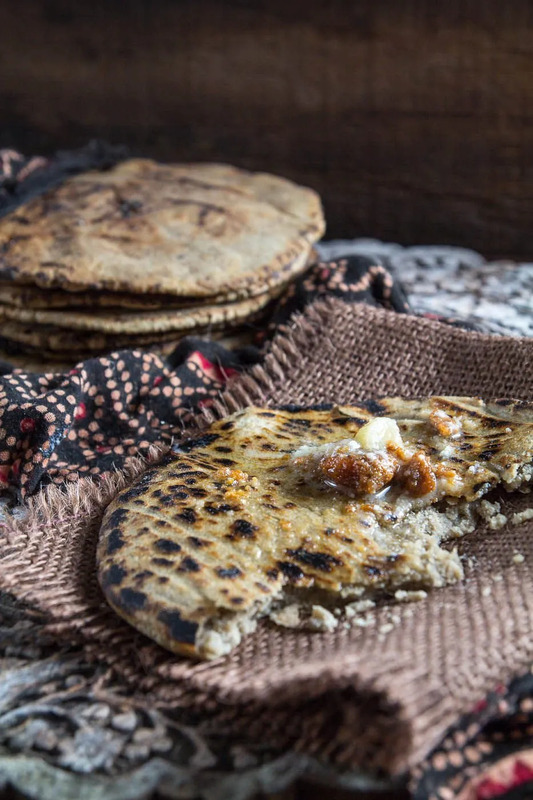 Comments on "Gluten-Free Millet Flat Bread (Bajri no Rotlo)"
Thank you for the recipe and the video. You and your mother are lovely! Thank you so much Zosia! :) I'll let my mom know. Just made these and they were so easy and tasty, especially with the curried pumpkin I made to go with it...really like that it's yeast free and egg free, very lovely recipe! Hi Mel! I'm so glad you made it and liked it. Your curried pumpkin sounds so delicious! :) I'm sure it was perfect with the rotlo. Thank you so much for this gluten free recipe. 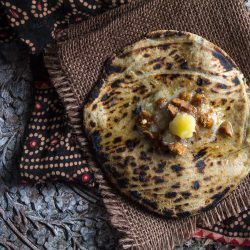 For years I've missed out on making my own Indian breads. I will get some millet and try this. If you don't have a gas stove how do you brown it? It's no problem if you don't have a gas stove. You could put a wire rack over your electric stove and brown over the wire rack or you could just flip the flat bread on the pan one extra time and press on it with the back of a wooden spoon. Either method will work fine. love this, have just ground some millet in a spice grinder to get flour as not so easy to get here. can't wait to make these! These look really good, I'm making them tonight to be apart of an eggplant sandwich. I really enjoyed the video, your mom seems really cool! Hello, thats a very nice recipe and movie. I was wondering how You can get rid of millet bitter aftertaste. When I make millet grain, not as flour, I usually roast or soak it for a few hours. After that usually bitter taste is gone. Or maybe it is not bitter when flour is made from roasted grains and my store-bought isn't? Hi Kazik. Since this is a millet flatbread, it's meant to taste like millet. If you're not a fan of the flavor, I would recommend trying the whole wheat paratha (https://indiaphile.info/how-to-make-parathas/) or the rice flour flat bread (https://indiaphile.info/rice-flour-flat-bread-chokha-ni-rotli/). I agree. The taste is awful. Thank you for posting this recipe! Can you tell me what kind of millet flour you use? I tried Bob's Red Mill Whole Grain Millet Flour, which is a yellow color. (I notice your seems to be more of a white color) My rotlis did not bubble at all and tended to fall apart. Hi ALexa. Sorry for the delayed response! I buy my millet flour at the Indian grocery store. Millet is usually labelled "bajri" at the Indian store. This recipe should work with the Bob's Redmill flour too. A tip about the flat bread - they are quite fragile and can fall apart easily. You may need to add a little extra water and be super gentle as you are transferring the rotlis. Hope this helps! Hi Puja, these look amazing! One question - can they be frozen and/or stored (in the fridge?) for a few days? Hi Nancy, Yes these can be frozen and reheated on a dry pan/cast iron skillet. The texture will not be the same as the fresh flat breads but it will work. Thanks Puja, I'll give it a try! Millet flour is the worst I have ever worked with. Used a tortilla press and baking paper to flatten these but they still cracked. Any suggestions? Hi Heidi. You're right! It is tricky to work with millet flour. I've never had luck with a tortilla press. I would recommend using the plastic from gallon sized zip lock bags ( cut the sides off) and using the old fashioned rolling pin. Go gently! This is a good recipe and nearly exactly the way my Abuela from Zihuatanejo causes it to be I'm excited to try out some of the additional recipes Kristin! I really like your answers how everyone has gaps in their own kitchen and that you aren't scared to step outside the box. Keep this up! For your"women" who bashed; pity you! What happened to others! I made these and loved them with peanut butter. Sprinkling some water on the bread while cooking is a very important step I found and helps them not fall apart. Cook on well seasoned cast iron.